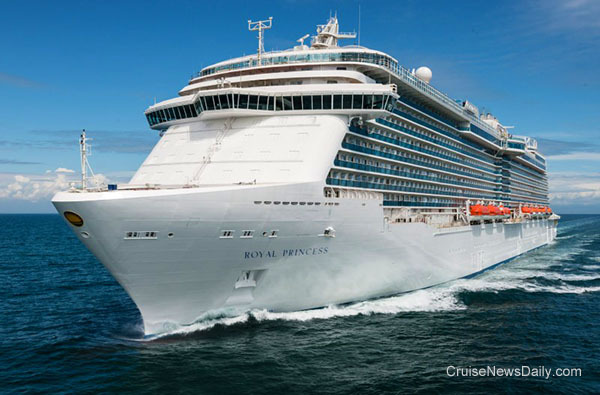 Royal Princess has completed sea trials and has returned to the Fincantieri yard at Monfalcone (Italy). The crew has arrived in Monfalcone and is now living aboard the ship which is in the final outfitting and provisioning processes. 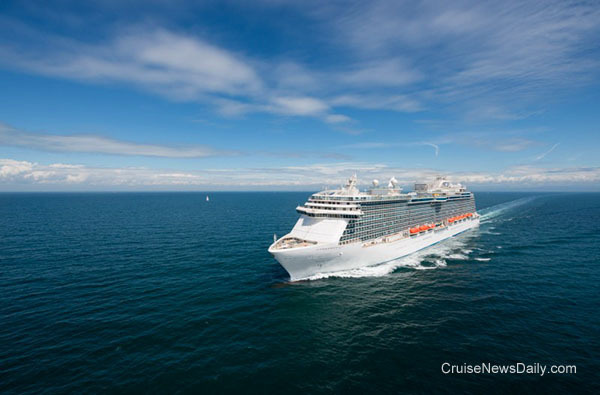 Fincantieri plans to hand the ship over to Carnival Corp on May 30 (2013), and it is expected to depart for Southampton on May 31, where it will arrive on June 7. The photos below were taken during the final sea trials in the Adriatic. 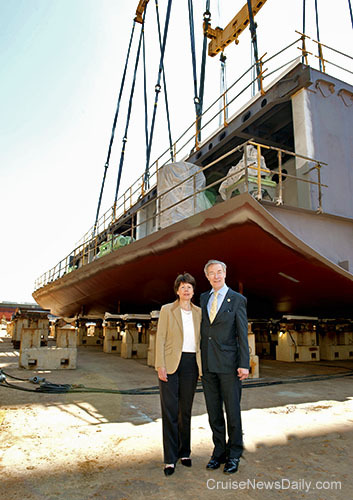 Fincantieri laid the keel today (May 15, 2013) for P&O's yet-unnamed 141,000-ton ship which will be delivered in March 2015. The rendering shows a distinctive twin funnel design. 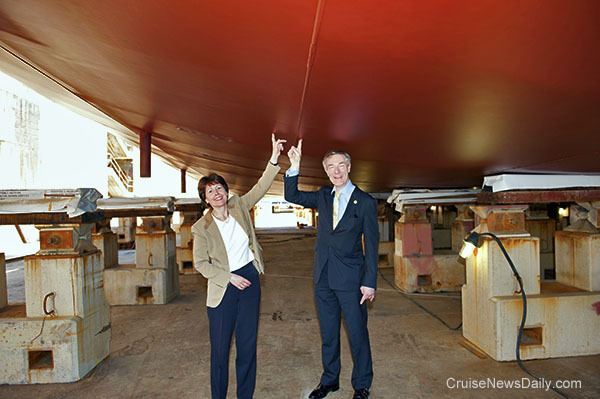 After the 408-ton section was lowered into place in the drydock at Monfalcone (Italy), P&O Managing Director Carol Marlow and Carnival UK CEO David Dingle posed with (and under) it. 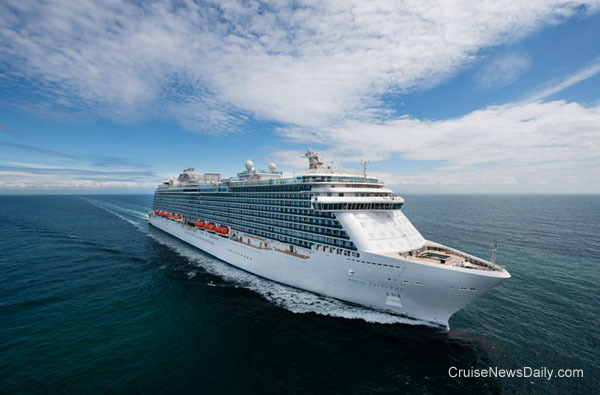 The complete story appeared in the May 15, 2013, edition of Cruise News Daily. From our friends at Thomson Platinum Cruises. You just have to see it to fully appreciate it. The Bermuda cruise season has barely begun, but that means it’s open season on extracting big fines from cruise ship passengers who visit the island. Customs officers made two unrelated arrests on Sunday aboard Norwegian Dawn when searches of their staterooms turned up small amounts of marijuana. The two men, in separate incidents, were jailed and tried on Monday. They were each fined $1,000 in lieu of spending 100 days in jail. Neither man was aware of Bermuda’s strict drug laws or that customs officers would board the ship actively searching for tiny infractions. One man had 13 grams, and the other five grams. The man with five grams said his was prescribed for chronic pain, but he did not have the prescription with him. Last year the island’s chief prosecutor indicated that she realized this was not a very hospitable way to treat the island’s visitors, and it would eventually drive many others away. Immediately these weekly arrests stopped. For some reason they started again this week. Possession of any amount of marijuana for any reason (including medical) is illegal in Bermuda, and the searches and arrests are completely legal. We don’t condone drug use, but the way the law is administered in Bermuda seems to be very much like a speed trap along a highway. One mile over the speed limit, posted on a partially concealed sign, nets a huge fine for the local government. The people we feel a bit sorry for are the ones who certainly aren’t trying smuggle drugs into Bermuda, nor are they even taking any ashore with them. They’ve left it safely put away in their stateroom, which is searched while they are out enjoying a day on the island. They return after a pleasant day only to find they are being arrested for something they didn’t even know was wrong. We understand that residents of the island are occasionally also found to have a similarly small amount of cannabis, but they are typically given an official warning which goes on their record. There is no fine or trial. It seems odd that the tourist, whom the government has courted to come there, isn’t offered that same leniency for a first offense. Of course the best advice is to know the law and be sure you don’t have anything illegal with you when you board the ship, and that eliminates the problem. But the way the government goes about this says something about their attitude toward the tourist. They go out of their way to find these infractions, and they freely admit that the fines help support government programming. Perhaps that’s their real motivation for doing it week after week after week, on almost every cruise ship that visits the island. Even if there’s no chance you’ll have anything illegal with you, do you really want to support a destination like that? Perhaps the best solution is for tourists to just skip Bermuda. If a ship stops there, choose another ship. The first block of Royal Caribbean's Quantum of the Seas arrived at Meyer Werft in Papenburg (Germany) last Thursday (May 9, 2013). It will await the keel laying at the yard. 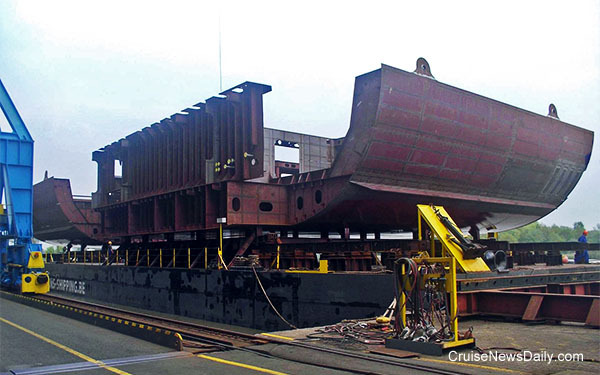 The 158,000-ton Quantum of the Seas will be delivered in the fall of 2015. 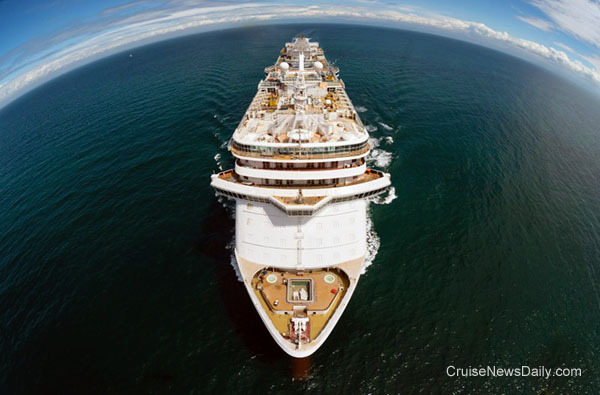 Photo courtesy of Royal Caribbean International.